Jaime observed, and others have confirmed, that the Great Basin wild horses travel 10- 20 miles every single day, over varying terrain including lots of volcanic rock. They navigate it effortlessly. The energy of predation, in other words, having natural predators, keeps the horse moving, bending to observe their surroundings, keeping in peak physical shape, and of course maintaining rock-crushing hooves. The Great Basin wild ones travel from water hole to water hole, interacting with other bands, and so on, in a state of constant movement. In a natural boarding environment we emulate this need to move by creating what we call a paddock paradise. By setting up multiple feed stations in your paddock, using small mesh hay nets, propagating other interesting and healthful items like loose rock salt, we encourage our horses to move all day. This keeps your horse in shape, happy, entertained, and feet healthy. Adding rocks or pea gravel to parts of the paddock is great too. Being a herd animal, they need companionship. They value family like we humans do, and the need to have other horses in contact with them all the time is part of their nature in order to groom, play, even fight, but more than that – to love. 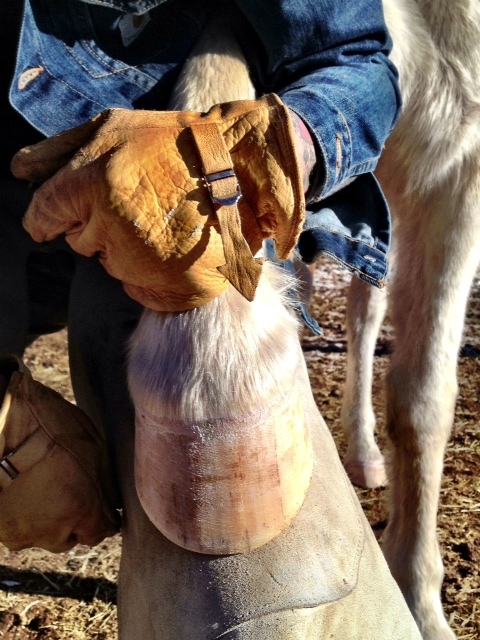 By mimicking the natural wear patterns, only removing that which would be worn away in the wild, we help precipitate natural growth patterns, coaxing into form the truly natural hoof belonging to that unique creature. There is no set angle, no set toe length, and no set measurement of any kind. 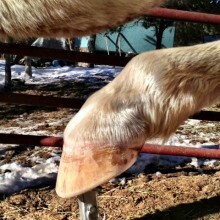 There is only undying variation in nature, and to try to manipulate a hoof into some set of measurements is dangerous. A NHC Professional does not need to worry about any of this, but simply apply the wear patterns and let nature take its course. Again a true Natural Trim is nothing more and nothing less than applying these wear patterns and only removing that which would be worn away in the wild. This is such a pivotal pillar, much of the time a make or break, in whether a horse will have ease and grace in going barefoot. Unfortunately this is one area of research yet to be conducted in the Great Basin, but nonetheless we know for certain what to avoid and what is working. By eliminating high sugar commercial feeds, high sugar supplements, and high sugar grasses, you are eliminating one major cause of laminitis, the number two killer of domestic horses. Too much sugar saturates the hindgut, resulting in a bacterial imbalance that through a cascade of events starts to create a separation of the hoof from the horse. This is extremely painful for a horse and easily avoidable. For your help, below is a little list of “goods” and “bads”. Over due-in the high sugar fruits. The horse has evolved to move in an exact fashion, through what we call the Natural Gait Complex. This is the walk, trot, canter, and gallop, in its myriad of forms. They did not evolve with a rider on their back, and so much consideration and preparation is needed. Most important, and the cornerstone of this pillar is riding in harmony with their natural gaits. By teaching a horse natural collection, the horse can develop a proper carrying shape, allowing them to carry a rider more comfortably without damaging them or causing them pain. We also recommend not mounting a horse until at least 5 years old, but if you will, closer to 7. The horse is the symbol and embodiment of grace in form. They are a reflection of the beauty and perfection of the natural world. To bring them into domestication requires much consideration and critical thinking. If your horse is not living the degree of soundness we know their species is capable of, then please consider rethinking the current traditions and practices, and consider the path of NHC. It will save you countless dollars in vet bills, unnecessary feeds and supplements, and detrimental shoeing costs. Most importantly you will have happy healthy horses for many years.